high quality jewelry that we acquire through the liquidation of personal estates. We select only the finest pieces for resale and then put each piece through a reconditioning process that involves inspection, repair if needed and refinishing to factory specs condition. 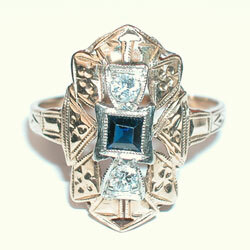 Estate jewelry is an excellent way to obtain a high quality piece of jewelry at a fraction of the retail price. Below is a current selection of our pieces in stock. Please contact us via email or phone to obtain pricing.